Remember full-size cars that were comfortable for five adults? Probably not, unless you’re of a certain age. 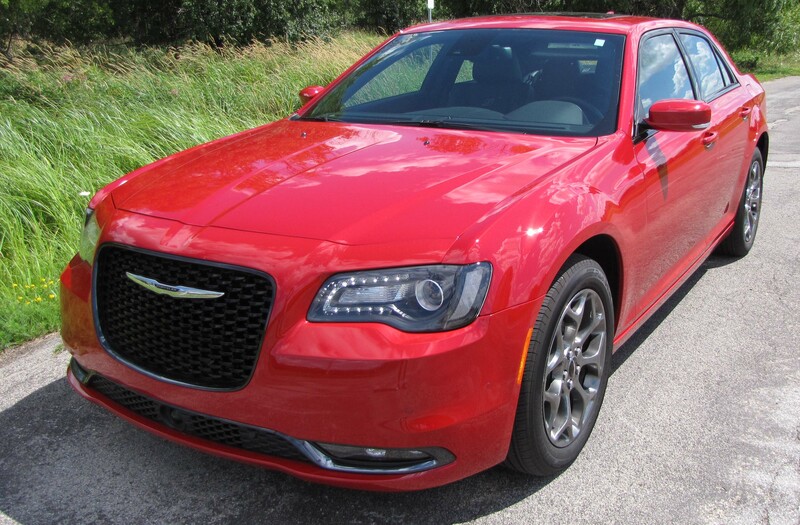 A few remain, the distinctive and elegant Chrysler 300 being one of the better efforts. First, it looks great with a big grille and chiseled lines that have only been somewhat softened around the nose for 2015 along with LED taillights added. 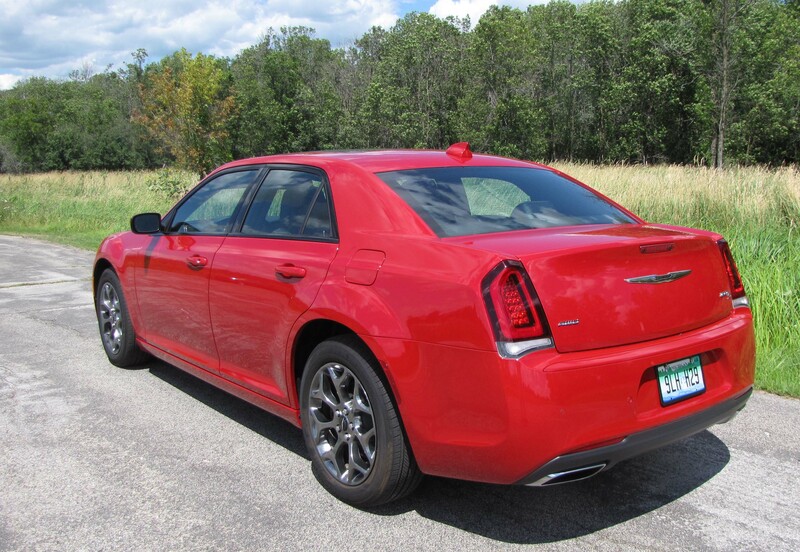 There are a variety of 300 models, but one feature, AWD, separates the big Chrysler from most other full-size cars. The bright metallic red test car was the sporty S version with AWD and a strong 3.6-liter V6 with variable valve timing. The V6 creates 300 horsepower and 264 ft.-lbs. of torque. Acceleration is quick and responsive. Getting up to highway cruising speed is a breeze and the 8-speed automatic shifts easily and uses the engine’s power well. Sport Mode is standard on the S and it allows you to adjust the transmission, throttle and steering at the press of a button. Sport mode on means heavier steering feel, longer shift points and more responsive throttle. Those with a racier driving attitude will appreciate the change, others can pass on the S and go with a lesser 300 model. Handling is decent, a little body lean in hard cornering and the rear-drive (normally) car pushes some in corners too, but then you probably won’t be driving it that hard most of the time. Ride is stiffer in the S than other 300s I’ve driven, which is too bad because normally the 300 delivers a superb family sedan ride. That’s what you expect with a 120-inch wheelbase, but with the S you’re going for sporty. 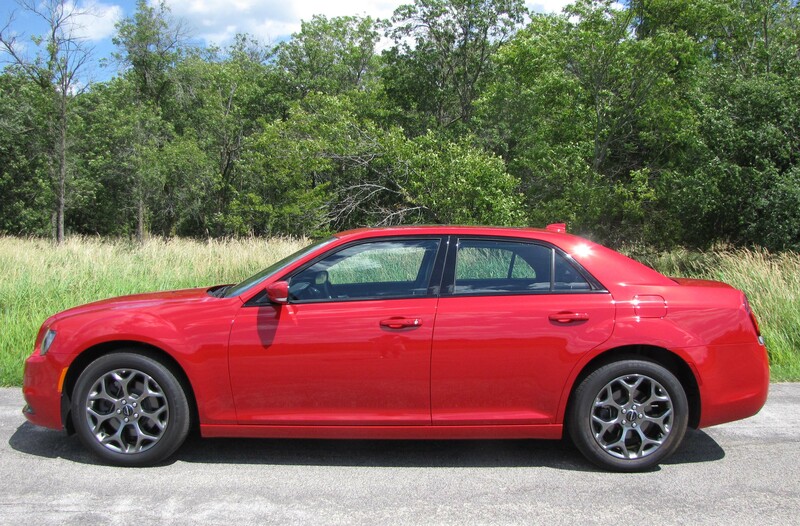 By the way, Chrysler has dropped the super sporty SRT8 version of the 300 this model year. Remember too that this has AWD to give the car more stability once the weather turns nasty. The 300 being rear-drive means that adding AWD will be a big help come winter. Inside, the test car featured black leather seats with white stitching and black gloss center stack trim, plus thin gloss black trim on the dash and doors. There’s also carbon fiber-look trim on the console and by the main dash gauges and a Beats stereo with its red logo on speakers in the doors. Overall the interior creates a solid luxury feel, but the seats are more supporting and form-fitting than in most large sedans. Again, that aims at the buyers who want a sportier feel. These are power seats with power lumbar support for the driver, but for my taste the seats are too firm, so can be a little tough on the tushie on longer rides. Dash layout is good and I really like the blue lights on the main gauges, plus the large navigation/radio screen. 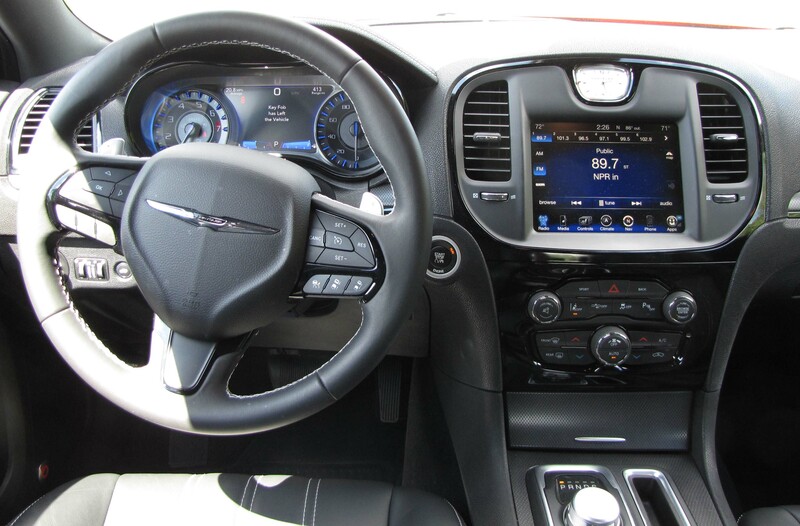 Everything here is easy to see and reach, plus Chrysler goes with a rotary dial for the transmission shifter. Jaguar is about the only other make that gives you that, although the Chrysler’s shift knob does not rise when the car is started and lower when it is turned off. So, one less thing to break in my opinion. While I had no trouble using the buttons on the manual tilt/telescope steering wheel, there are a lot, 16 to be exact. That could be confusing to less attentive drivers. The good news is that there’s a backup camera and blind-spot warning system here, along with heated seats. The fancy Beats stereo comes with 10 speakers, a 552-watt amp. A $3,295 option package includes a panoramic sunroof, parking sensors and cross-traffic alert, plus Uconnect and an HD radio and courtesy lamps in the exterior mirrors. A $1,695 package adds lane departure warning, adaptive cruise control, rain-sensing wipers and full-speed forward collision warning among other electronics. Love the blue lights in the main gauges, they are easy on the eyes at night. In back is a big trunk to carry the family’s luggage on a long trip and inside there are good visors that slide and include extenders. However, the center armrest/storage box feels cheap and fits loosely. This is plastic and not up to the rest of the car’s fit and finish, even with the leather padding on its top. I also don’t like the extremely thick leather covered steering wheel. Smaller drivers’ hands will get tired holding this thing. Gas mileage was moderate. I got 20.9 mpg in about 75% city driving. The EPA rates the S at 18 mpg city and 27 mpg on the highway. Pricing? The base 300 Limited starts at $32,390 and includes a 292-horse V6. Of course it’s rear-drive. The S boosts the power and this one adds AWD to list at $37,570, plus a $995 delivery fee. With options the test car hit $44,055. Moving up to the ultimate 300 Platinum with AWD pushes the starting price to $45,890. 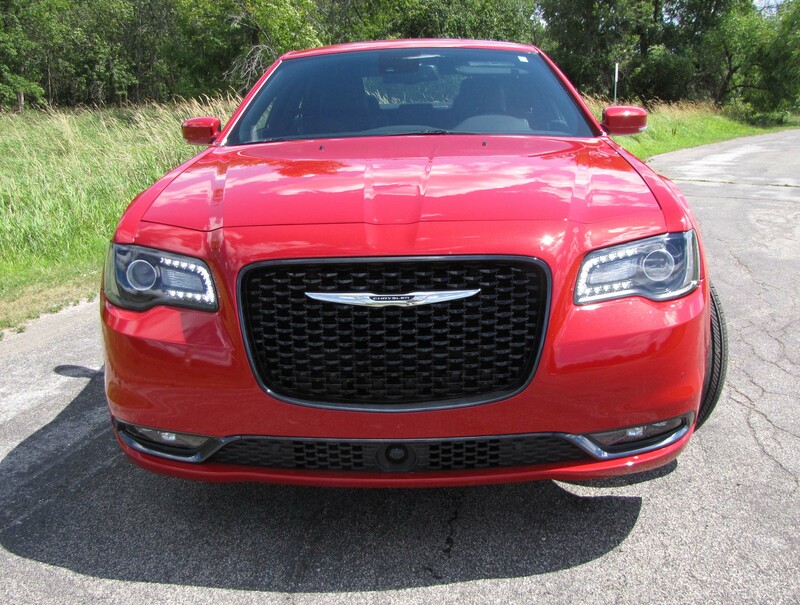 Many choices here, but if you need a full-size car Chrysler’s 300 has plenty of style and power, plus a luxury feel. Hits: Distinctive elegant looks, room for five adults, a luxury feel interior with supportive leather seats, plus blind-spot warning, rearview camera, giant sunroof and a big trunk. Strong engine and AWD too, a rarity in this size sedan. Nice blue-lit gauges, big nav/radio screen, rotary shift knob and visors slide and extend. 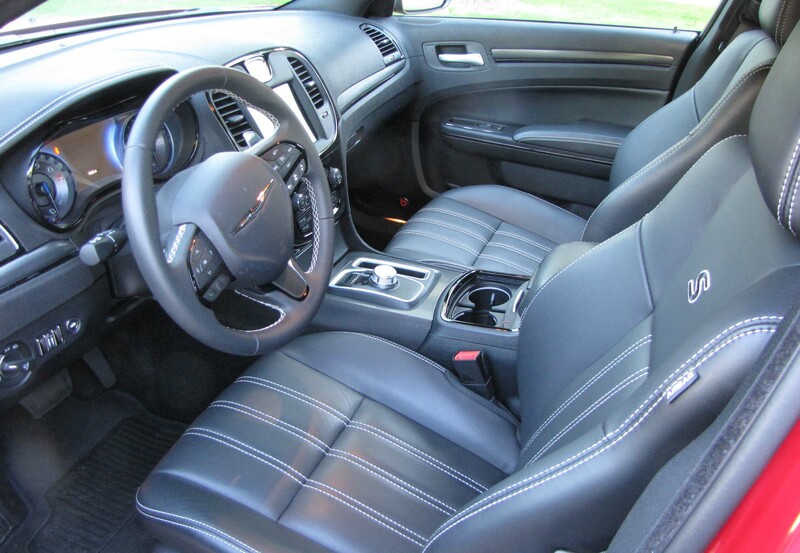 Misses: Stiff ride, firm seats, thick leather wheel, 16-button steering wheel hub and cheap feeling center armrest.